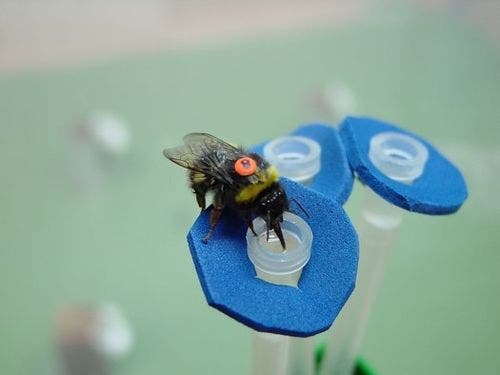 In a recent study, researchers reported that bumblebees were able to figure out the most efficient routes among several computer-controlled "flowers," quickly solving a complex problem that even stumps supercomputers. We already know bees are pretty good at facial recognition, and researchers have shown they can also be effective air-quality monitors. To test bee problem-solving, researchers Lars Chittka and Mathieu Lihoreau tested bees’ response to computer-controlled artificial flowers. They wanted to see whether the bees would go after the flowers in the order in which they were discovered, or if they would figure out the shortest route among all the flowers even as new ones were added. The bees explored the locations of the flowers and quickly figured out the shortest paths among them, according to a Queen Mary news release. This is no small feat, especially considering the tiny size of bee brains. When it comes to certain types of intelligence, size apparently does not matter. Early last year, researchers showed that bees recognize individual faces because they can make out the relative patterns that make up a face. The new research further suggests bees are highly sophisticated problem solvers, and that better understanding of their brains could improve our understanding of network problems like traffic flows, supply chains and epidemiology. The research was published in the journal The American Naturalist.